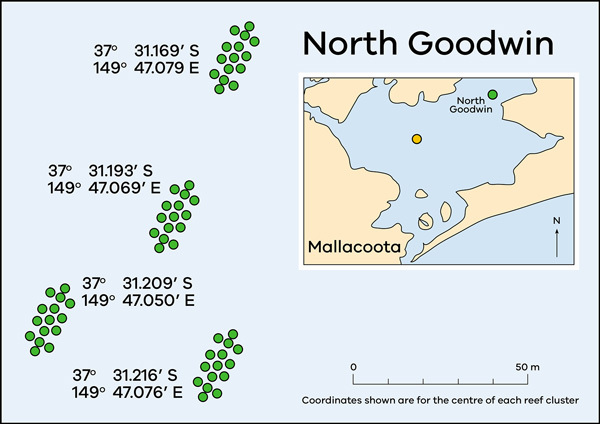 In 2014 the department established 8 new recreational fishing reefs in East Gippsland. These reefs will improve fishing opportunities for both boat and shore-based fishers. The creation of the eight new reefs was funded by the Recreational Fishing Initiative. Apart from these new reefs, the Initiative has also improved angler access, stocked more trout and native fish, upgraded boat launching facilities, built fish cleaning tables, boosted fisheries research and strengthened fisheries enforcement and education. Where are the new reefs? 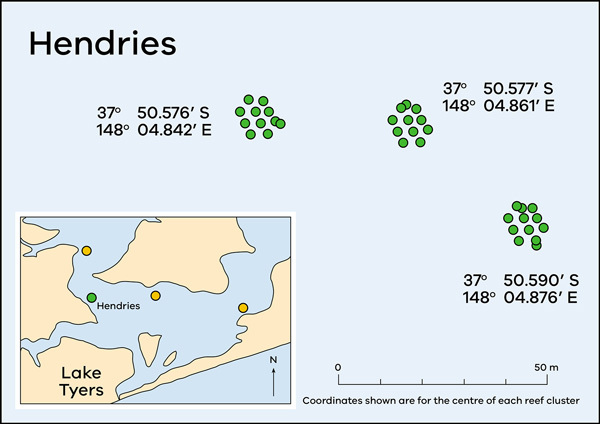 The eight reefs are spread across three major estuaries, all of which are popular with recreational fishers. 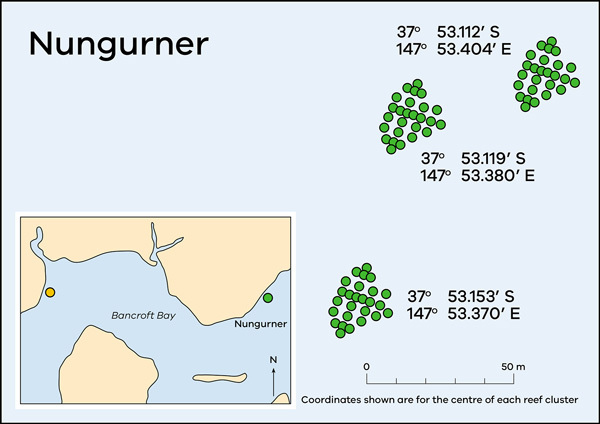 Two reefs have been built in the Gippsland Lakes, one at Metung and the other at Nungurner. 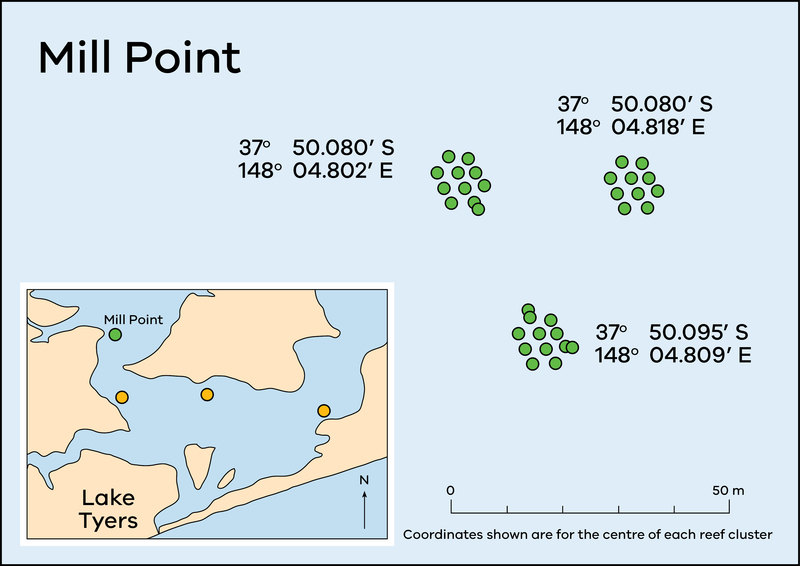 The Metung reef can readily be accessed by shore-based fishers. 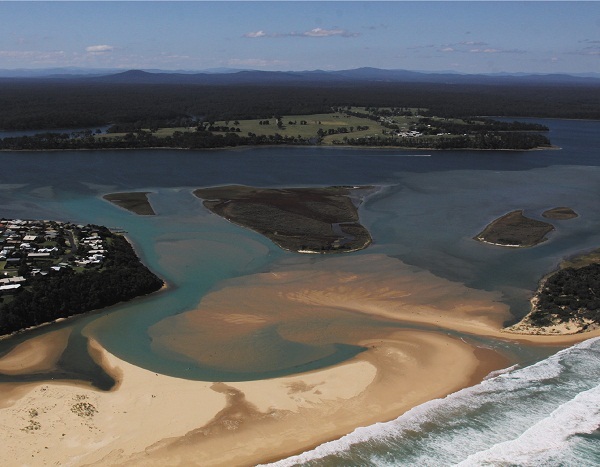 Four reefs have been built in Lake Tyers. Three of the reefs are situated in the bottom lake and a fourth is situated out from Mill Point in the Toorloo Arm. 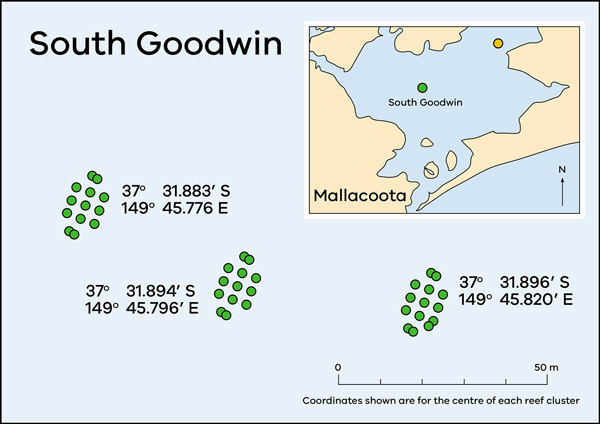 Two reefs have been built in Mallacoota Inlet around the area known as the Goodwin Sands in the bottom lake. What do the reefs look like? 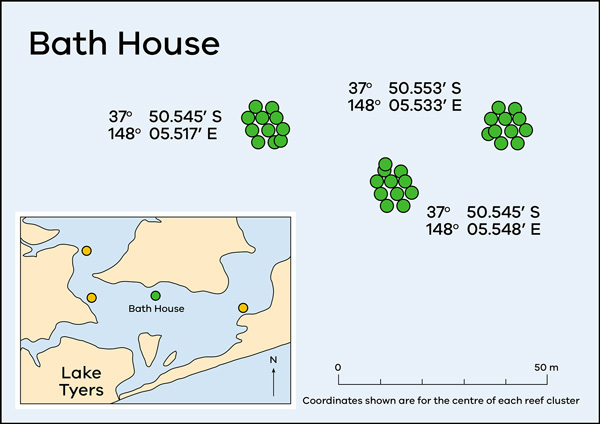 Each reef consists of a number of smaller 'patch reefs' which are made up of 15 purpose-built reef modules of different shapes and sizes. These concrete reef modules have a rough surface and a number of holes and cavities in them to allow water flow and provide refuges for marine life. The concrete mix is environmentally-friendly so there is no leaching of toxins. What fish will they attract? The reefs are expected to be rapidly colonised by a variety of aquatic plants and animals. 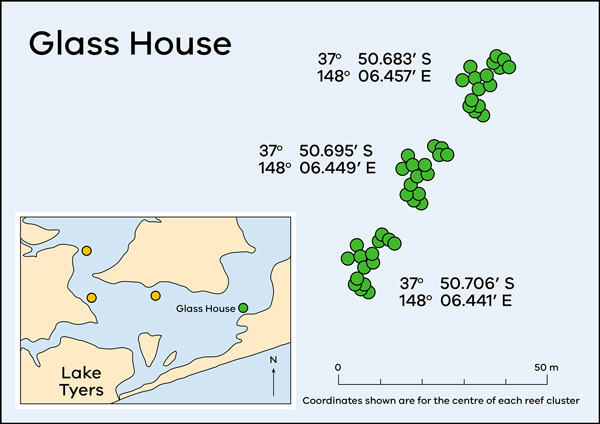 Bream, snapper and dusky flathead are likely to be the main species attracted to the reefs. Other species likely to occur on the reefs from time to time include leatherjackets, luderick, silver trevally and mulloway. 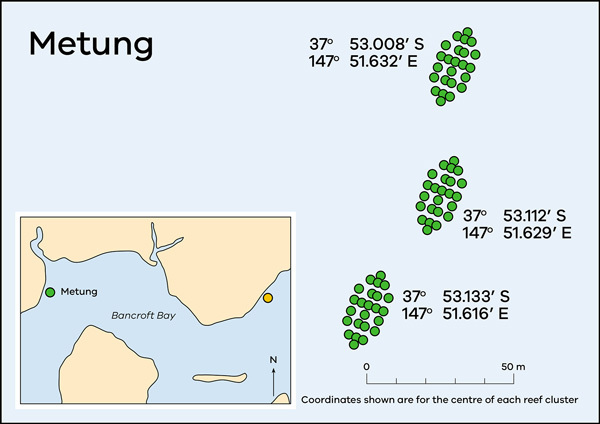 The two reefs at Metung and Nungurner in the Gippsland Lakes have commercial fishing exclusion zones around them, so can only be fished by recreational anglers. Commercial fishing exclusion zones are not required for the reefs in Mallacoota Inlet and Lake Tyers as both of these waters are managed as Recreational Fisheries Reserves, and so are closed to commercial fishing except for a small number of licenced bait fishermen. The reefs may at times hold congregations of juvenile fish. Please fish responsibly and adhere to Fisheries regulations at all times. Refer to the Victorian Recreational Fishing Guide for more information. The department does not condone the dumping of any material to create illegal reefs in Victorian waters. Please contact the Environment Protection Authority on 1300 EPA VIC (1300 372 842) if you spot illegal dumping.